Berytus (Colonia Iulia Augusta Felix Berytus) was a Roman colonia that was the center of Roman presence in the eastern Mediterranean shores south of Anatolia. 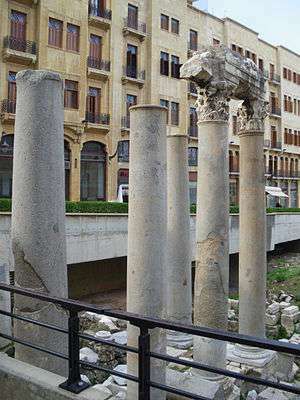 Roman Berytus (modern Beirut) was the capital of Phoenicia during Roman times. In 140 BC the Phoenician village called "Biruta" was destroyed by Diodotus Tryphon in his contest with Antiochus VII Sidetes for the throne of the Macedonian Seleucid monarchy. Later it was soon rebuilt on a more conventional Hellenistic plan and renamed Laodicea in Phoenicia (Greek: Λαοδίκεια ἡ ἐν Φοινίκῃ) or Laodicea in Canaan in honor of a Seleucid Laodice. The city was conquered by the Romans of Pompey in 64 BC and renamed "Berytus", as a reference to the name of the old original phoenician port-village. The city was assimilated into the Roman Empire, veteran soldiers were sent there, and large building projects were undertaken. ...(Berytus) was made a Roman colony about 14 B.C. Herod the Great, Agrippa I and II, and Queen Berenice built exedras, porticos, temples, a forum, a theater, amphitheater, and baths here. In the 3d c. A.D. the city became the seat of a famous school of law and continued to flourish until the earthquake of A.D. 551 ravaged the city....Its streets, laid out on a grid plan, are spaced at roughly the same intervals as those of Damascus and Laodicea. The new Roman city spread farther S and W (of the port), with its Forum near the (actual) Place de l'Etoile. On its N side was a civic basilica 99 m long with a Corinthian portico of polychrome materials..., dating from the 1st c. A.D. Some large baths have been uncovered on the E slope of the (actual) Colline du Sérail, and the hippodrome lay on the NW side of the same hill. Some villas in a S suburb facing the sea had mosaic floors (now in the Beirut Museum).Some 12 km upstream on the Beirut river are the ruined arches of an aqueduct. Berytus was considered the most Roman city in the eastern provinces of the Roman Empire. It was one of four Roman colonies in the Syria-Phoenicia region and the only one with full Ius Italicum (meaning: exemption from imperial taxation). Its territory under Claudius reached the Bekaa valley and included Heliopolis: it was the only area mostly latin-speaking in the Syria-Phoenicia region, because settled by Roman colonists who even promoted agriculture in the fertile lands around actual Yammoune. From the 1st century BC the Bekaa valley served as a source of grain for the Roman provinces of the Levant and even for the same Rome (today the valley makes up to 40 percent of Lebanon's arable land):Roman colonists created there even a "country district" called Pagus Augustus. In 14 BC, during the reign of Herod the Great, Berytus became an important Roman colonia. The city was named Colonia Iulia Augusta Felix Berytus in honor of Julia, the only daughter of Augustus (according to Theodore Mommsen, "Res gestae divi Augusti", II, 119). Furthermore, the veterans of two Roman legions were established in the city of Berytus by emperor Augustus: the fifth Macedonian and the third Gallic. Consequently, the city quickly became fully Romanized. Large public buildings and monuments were erected and Berytus enjoyed full status as a part of the empire. Agrippa greatly favoured the city of Berytus, and adorned it with a splendid theatre and amphitheatre, beside Baths and porticoes, inaugurating them with games and spectacles of every kind, including shows of gladiators. But now only minor ruins remains, in front of the Catholic Cathedral of Beirut. 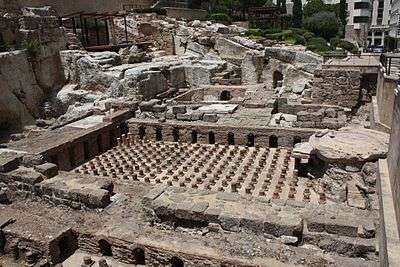 Indeed, four large bath complexes as well as numerous private baths increased the city’s water consumption: the Romans constructed an aqueduct fed by the Beirut River whose main source was located 10 km from the city. The aqueduct crossed the river at Qanater Zbaydeh and the water finally reached the place of actual Riad Al Solh Square; there, at the foot of the Serail Hill, it was stored in large cisterns. An intricate network of lead or clay pipes and channels distributed the water to the various pools of the Roman Baths. Berytus had a monumental "Roman Gate" with huge walls (recently discovered) and was a trade center of silk and wine production, well connected by efficient Roman roads to Heliopolis and Caesarea. According to Kevin Butcher, the Latin character of Berytus remained dominant until the fifth century: the city was a center for the study of Latin literature and -after Septimius Severus- of Roman Law. 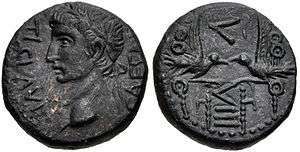 Under Nero the son of a roman colonist, Marcus Valerius Probus (born in Berytus around 25 AD), was known in all the empire as a Latin grammarian and literature master philologist. Roman emperors promoted the development of high-level culture in the fully Romanized city (even in Greek language as with Hermippus of Berytus): its Law School was widely known in the Roman empire; two of Rome's most famous jurists, Papinian and Ulpian, both natives of Phoenicia, taught there under the Severan emperors. When Justinian assembled his Pandects in the sixth century, a large part of the "Corpus of Laws" was derived from these two jurists, and in 533 AD Justinian recognized the school as one of the three official law schools of the empire. After the 551 Beirut earthquake the students were transferred to Sidon. Since the third century, the city had an important law college. It was here that the great codification of Roman Law, which was to be propagated by emperors like Theodosius II and Justinian, was prepared. Under the Eastern Roman Empire, some intellectual and economic activities in Berytus continued to flourish for more than a century, even if the Latin language started to be replaced by the Greek language. 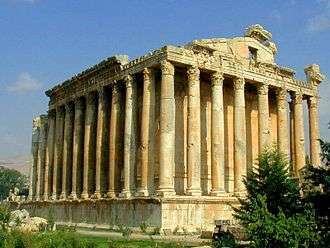 However, in the sixth century a series of earthquakes demolished most of the temples of Heliopolis (actual Baalbek) and destroyed the city of Berytus, leveling its famous law school and killing nearly 30,000 inhabitants. Furthermore, the ecumenical Christian councils of the fifth and sixth centuries AD were unsuccessful in settling religious disagreements within the surviving community. Berytus became a "Christian See" at an early date, and was a suffragan of Tyre in "Phoenicia Prima", a province of the "Patriarchate of Antioch". In antiquity its most famous bishop was Eusebius, afterwards Bishop of Nicomedia, the courtier-prelate and strong supporter of Arianism in the fourth century....In 450 AD Berytus obtained from Theodosius II the title of metropolis, with jurisdiction over six sees taken from Tyre; but in 451 AD the "Council of Chalcedon" restored these to Tyre, leaving, however, to Berytus its rank of metropolis (Mansi, VII, 85-98). Thus, from 451 AD Berytus was an exempt metropolis depending directly on the Patriarch of Antioch. This turbulent Byzantine period weakened the Romanized (and fully Christian) population and made it easy prey to the newly converted Muslim Arabs of the Arabian Peninsula. Roman Berytus -reduced to the size of a village- fell to the Arabs in 635 AD. 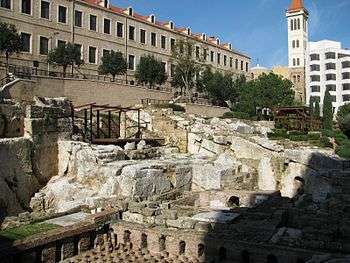 Roman Ruins in the "Roman Baths Garden"
General view of the "Roman Baths Garden"
Recently at the Garden of Forgiveness the two main streets of Roman Berytus, the Cardo and Decumanus Maximus, were discovered in the Beirut Central District. Their shaded colonnades became busy markets on festival days. At other times, these streets would have been frequented by Law School students and citizens passing to the Forum or visiting temples and churches. In 1968 were discovered the "Roman Baths" Gardens, that is a landscaped public space that lies on the eastern slope of the Serail Hill. It consists of a garden and a set of uncovered ruins of the ancient Roman baths of Berytus (hence the name of the place). These ruins underwent a thorough cleaning and further excavation in 1995-1997. Designed by the British landscaping firm Gillepsies, the Garden's layout is dominated with low-slung glass walls and lookout platforms that can be turned into concert venues, thus giving a 21st-century touch without harming the area's historical fabric. At the turn of the 20th century was identified the area were existed the famous school of Roman law at Berytus. Archaeological excavations in the area between the Saint George Greek Orthodox Cathedral and Saint George Cathedral of the Maronites unearthed a funerary stele etched with an epitaph to a man named Patricius, "whose career was consecrated for the study of law". The epitaph was identified as being dedicated to the famous 5th-century law school professor. In 1994, archaeological diggings underneath the Saint George Greek Orthodox Cathedral in Beirut Central District's Nejmeh Square identified structural elements of the Anastasis cathedral, but they were restricted to an area of 316 square metres (3,400 sq ft) and failed to unearth the interred school. In the 5th century, Zacharias Rhetor reported that the school stood next to the "Temple of God", the description of which permitted its identification with the Byzantine Anastasis cathedral. ↑ About Beirut and Downtown Beirut, DownTownBeirut.com. ↑ Czech excavations in Beirut, Martyrs' Square, Institute for Classical Archaeology> Archived July 23, 2013, at the Wayback Machine. ↑ About Beirut and Downtown Beirut, DownTownBeirut.com. Retrieved November 17, 2007. ↑ "Beirut Shakes Off Rubble, Dons Slick New Architecture". Co.Design. Collinet, Paul (1925). Histoire de l'école de droit de Beyrouth (in French). Paris: Société Anonyme du Recueil Sirey. Gil, Moshe; Ethel Broido (1997). A History of Palestine. Cambridge University Press ISBN 978-0-521-59984-9. Mouterde, René et Lauffray, Jean (1952) Beyrouth ville romaine. Publications de la Direction des Antiquités du Liban, Beyrouth. Skaf, Isabelle; Yasmine Makaroun Bou Assaf (November 29 – December 3, 2005). Aïcha Ben Abed Ben Khader; Martha Demas; Thomas Roby, eds. Une nouvelle approche pour la préservation in situ des mosaïques et vestiges archéologiques au Liban: La crypte de l'église Saint-Georges à Beyrouth. Lessons Learned: Reflecting on the Theory and Practice of Mosaic Conservation (9th ICCM Conference, Hammamet, Tunisia) (in French). Getty Publications. ISBN 9780892369201.